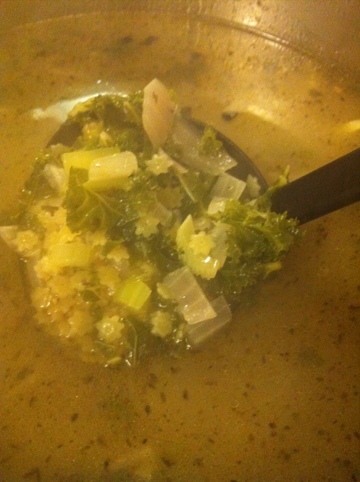 This is one of my favorite soup, so when I purchased a packet of Stelline (Stars) pasta I set out to try it for myself. The results were great! 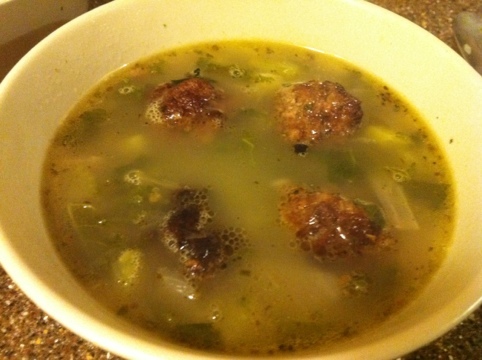 This is a light soup base with a hearty homemade meat ball. Melt butter in a large stock soup pot over high heat. Add onion, celery, garlic, herbs. Cook about 5 minutes, add chicken broth and then water, fill your pot but don’t water down your base too much. I add about 2 quarts slowly. Let boil and add kale. Let cook until it wilts and falls apart, then add stars. The pasta will cook quickly, so the soup may be hot enough to overcook them. Make sure your veggies are done before you throw in the pasta. Remove from heat and add meatballs to bowls, 3-4 each bowl. You can mix them all together. The meatballs will stay together, yet very moist because of the soup base.